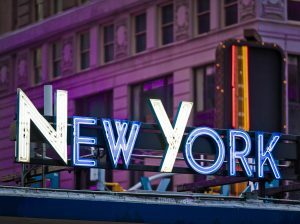 Effective April 7, 2017, the New York City Department of Buildings (DOB) added a new section to the Rules of the City of New York (RCNY), which governs sign hanging. The amendment permits licensed sign hangers (Master Sign Hangers and Special Sign Hangers) to file applications for signs and related structural elements that comply with specific requirements. This change eliminates the need to hire registered design professionals or permit expediting services in NYC, in certain situations. Master Sign Hangers hoist, lower, hang, or attach signs, irrespective of weight, upon or on the outside of a building. Special Sign Hangers have size and weight restrictions upon the signs that they hoist, lower, hang, or attach upon or on the outside of a building. Speaking of restrictions . . .
Sign application must comply with applicable provisions of the New York City Building Code and Zoning Resolution. The sign’s display face area cannot exceed 150 s.f. No portion of the sign may project more than 18 inches beyond the building face, regardless of setback. All of the sign must be mounted below the level of the second-story ceiling. The sign cannot exceed 300 pounds in total weight, including any related structural elements. Signs must be mounted with mechanical anchors, installed according to the table below. A minimum of four anchors must be used, fastened 12 inches on center. In addition, the anchors must support five times the weight of the sign and any structural elements. If you have any questions about this or other DOB matters, please call Metropolis Group at 212.233.6344 or by email at contact@metropolisny.com.